Excessive or overthinking (rumination) is thinking about something in an endless circle. It exhausts the body unconsciously and causes a lot of depression and anxiety. There are many things that cause you to think too much like going bankrupt from business, the debt must be paid and at the same time, you also have to send your child to a school that requires a lot of money. All of this might make you think continuously without conclusions and finally you are depressed. You can think of it all in a circle without end. In essence, thinking something over or brooding continuously is something that is not good for psychology and health in general. So many people are distancing this or trying to be indifferent to some problems when in trouble, the goal is to get comfortable and not be too burdened with the problem. Ok, in this article, we will see how to stop overthinking? Some people in certain conditions cause him to think continuously and cannot stop, sometimes imprisoning him in difficulties and stresses. This tendency to think too much in the world of mental health is called rumination and this is a bad thing for health. Ok, on this occasion we will see the meaning of the word rumination, what do experts say about rumination? Hopefully, it can be a way out for those of you who often overthinking. Winch, a psychologist, and author of the book “Emotional First Aid: Hurt Healing Rejection, Guilt, Failure, and Other Everyday“, said that “rumination means ‘chew over'”. So, according to him, the word comes from how a cow chews the food, then vomiting and chewing back in. This is how the cow digests food. For humans, this is chewing the mind in a depressed state. So, contemplating it is contemplating a sickening and annoying thought. This annoying thought will be replayed in one’s brain and this results in stress and depression. 2. Contemplation has to do with depression and anxiety in a number of ways, even as a symptom for both. As a psychologist who has faced many people who are overthinking, I can clearly say that it is very annoying. Overthinking spends time without success and makes a person drained of energy so that many of those who experience overthinking end up experiencing stress. Rumination is a unique condition because it turns into a symptom of stress and anxiety. Those who suffer from depression are those who think of past failures and losses. People who are contemplating and anxious are lost in the thought of “how to” and he forever imagines negative results. Well, sometimes people who are stressed also don’t want to experience it, but they can’t get themselves out of it. 3. Ruminators sometimes think they’re solving a problem, but it’s not. People who experience contemplation sometimes consider themselves looking for solutions, even though this is nonsense. It is precisely solving the problem with careful and careful thinking. Weherenberg, a psychologist and author of the book “The 10 Best-Ever Anxiety Management Techniques and The 10 Best-Ever Depression Management Techniques“, says that rumination is a mind that is repetitive about the same thing and has no solution. So, according to him is a problem that has no way out. Rumination tends to occur from bad things. You should not think of something that makes you angry. Indeed, sometimes this thought comes unstoppable and tends to linger in someone’s mind. Thinking of bad things actually stimulates you to be angry and destructive or kill, this is very dangerous for someone’s mentality. Thinking about troublesome things or contemplating bad things or bad experiences is the same as arousing pressure and eventually giving rise to stress hormones all the time. Winch, said that we could spend hours thinking about troublesome things and finally putting us in a state of physical stress and emotional stress. This problem is almost the same as mental disorders, the risk is enormous. This can cause clinical stress, problems in solving problems, eating disorders, and can even cause heart disease or dependence on illegal drugs. Those who often experience rumination will cause brain circuits. Wehrenberg said that rumination will change the structure of the brain so that the brain’s thinking will always lead to contemplation. The longer, the brain will be more aroused to do rumination every day. This disease, more and more severe, but the sufferer is not aware of it. 7. The more you do it the more difficult it is to stop. We are talking about how to stop overthinking or rumination. It needs to be remembered that, someone who often drops it into rumination will make it more difficult for him to change or quit overthinking. This can be a habit of thinking, it really becomes a challenge for someone to turn to other thoughts. In other words, this is an addiction to reflect on the problem. So, if you think “if I think about it long enough I will find the answer”, it is wrong. The more rumination is done, the more difficult it will be to stop. This is the same as some mental health problems, being aware of yourself is very helpful to get out of this confinement. Winch said that the first step to quitting overthinking was to realize it was a dangerous problem. He said, once he knew that the thought was coming, we had to catch it and turn it into problem solving. For example, “I don’t believe that happened” we turn it into “what I can do to prevent that from happening”. Or it can’t be like; “I don’t have friends” we change our mind to “what should I do to get lots of friends”. You must first catch it and stop it before it starts. So, prepare lots of positive questions, like “I have to try my best” or “I have a lot of support if I want”. This sounds very easy, but this is very difficult to practice, so you have to try every time and keep trying to be able to defeat your negative thoughts. 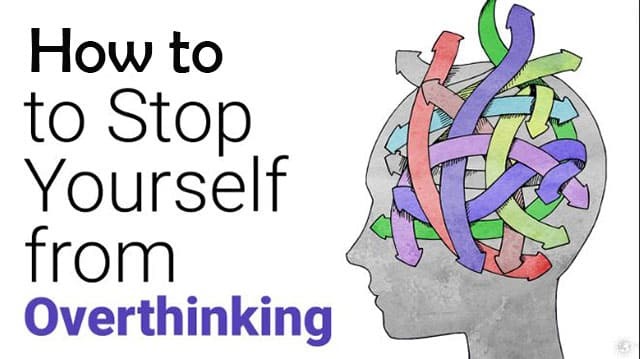 Next, how to stop overthinking is to shift your mind to something else outside the rumination circle or something else that you need to focus on. This is very important to do, because once you have managed to divert your mind from that bad thing, then you have succeeded for that moment. But that thought will come again and again. You must be ready at all times with other thoughts that need your focus so that you avoid rumination. Remember! The more you get trapped in rumination or overthinking, the more difficult it will be for you to stop it.